The Eden Angling Association is a non profit making organisation, open to all. We promote the sport of angling for salmon, sea trout and brown trout on the Fife shire river Eden as a facility for members of the Association for fishing, and for the benefit and enjoyment of the public. We aim to restore and conserve the river, improving its habitat and encouraging bio diversity. A folding landing net has been found on the river in the vicinity of Clayton Caravan Park. If you are missing yours please contact the finder, Brendan by e-mail at leven015@gmail.com . 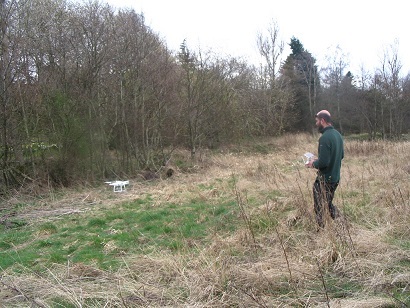 The Tay Board bailiffs will be carrying out a survey of the Eden between Pitlessie and Cupar over the next few weeks, The Boards Drone is a nifty piece of kit and can video the river to monitor recovery of the Ranuculous water crowfoot weed lost to pollution in 2016. This weed was once plentiful here and is considered essential cover for survival of juvenile fish. The Tay Board checked out the location today at Cults Mill. After a stormy start to the season and some coloured water early in March reports are coming in of fresh sea Trout being caught in the Pouch and Estuary around the 2 lb mark. The EAA sign has been put back up after the fence was demolished by cattle. The TDSFB 2018 annual report can be accessed via the link below.